Indian Institute of Management (IIM) Calcutta has successfully conducted the first slot of Common Admission Test (CAT) 2018. The first slot exam which was scheduled from 09 Am to 12 PM. The candidate appeared for the exam have started to cascade their reactions. Based on the candidate reaction the overall difficulty level of the exam was moderate to difficult. According to the candidate’s reactions, Verbal Ability & Reading Comprehension (VARC) section was easy. Candidates also found Data Interpretation & Logical Reasoning (DILR) section moderate and on the other hand, the Quantitative Ability (QA)section was very difficult according to candidates. The total number of questions in VARC was 34 in the first slot. The number of questions from the Reading Comprehension was 24 and 10 questions for Verbal Ability. The question covers the topics such as Plastics and Environment (5 questions), Economy and happiness (5 questions), India and World War 2 (5 questions), Elephants and Humans (5 questions), Genetics (4 questions). In DILR sections the total number of the question was 32 in the first slot. 24 question was Multiple Choice and 8 questions were Non-Multiple Choice. Quantitative Ability section holds 34 questions in total. Dividing the question of QA section 24 was Multiple Choice and 10 of Non-Multiple Choice. Comparing the previous year paper analysis VARC section was easier which remain to be the same this year. Previous year DILR was the difficult section for the candidates but it turns out to be moderate in this year on the difficulty scale. Quantitative Ability turned out to be a difficult section among all three section in comparison to previous analysis. The IIM Calcutta is expected to release the answer key in the first week of December. As per the CAT 2018 exam pattern, the exam is conducted in the Computer Based Test (CBT) mode. The paper is divided into three sections such as Quantitative Ability (QA), Data Interpretation & Logical Reasoning (DILR) and Verbal Ability & Reading Comprehension (VARC). Candidates have to attempt 100 question in 3 hours(180 minutes). Talking about the marking scheme the test each correct questions carries 3 marks and -1 for the negative attempt. The distributions of the number of the question among the three sections are such as VARC – 34, DILR – 32 and QA- 34. The second slot exam will start from 02:30 PM. The exam will get over by 05:30 PM. Approx 2 lakh candidates registered for the test. 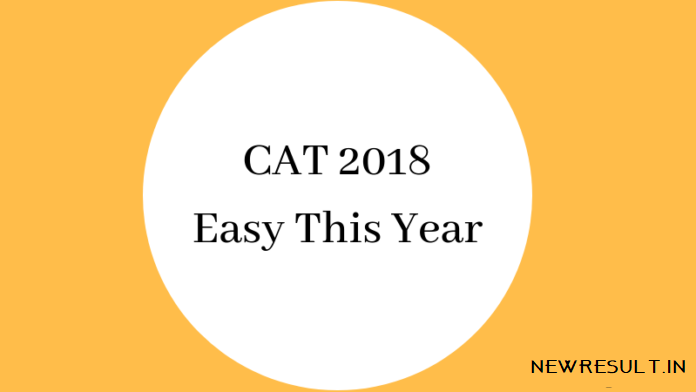 CAT 2018 is being conducted in 147 cities across 347 test centres.